Many, many years ago I was an exchange student in Germany. I was living with my host family in Bavaria during winter time, and got to experience the traditional Christmas we read about in story books and movies, namely that there was snow – and the first time I’d ever seen it falling from the sky. The thing that struck me the most was how much Christmas was embraced. There were Christmas markets on the weekend, tasteful decorations in all the stores and at home we had a working bee on the first weekend of December where we made a huge batch of various cookies to share with visitors during the Christmas period. This is a tradition I would like to keep alive with at home. It’s a great way to get together with friends and family, bake and snack on sweets and feel organised for the festive period. 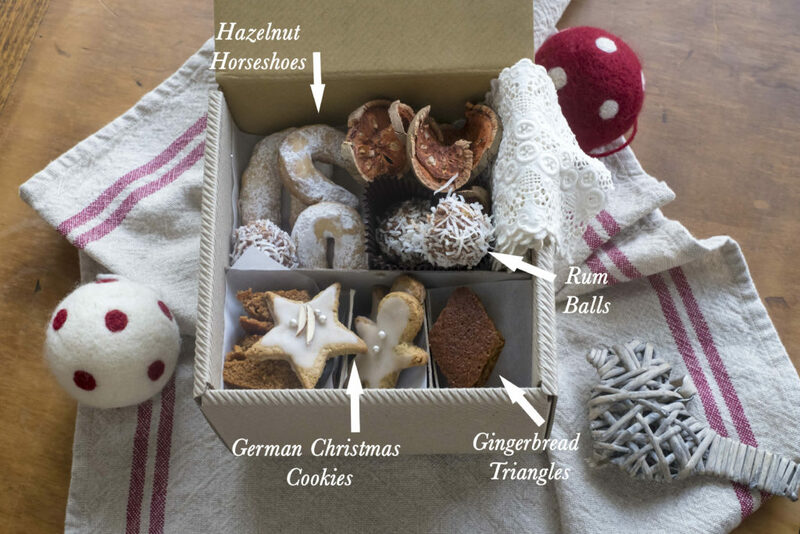 So, how to make your own Christmas Cookie Box? All you need to do is gather a few small boxes (depending on how many people you’re gifting them to); I bought mine from Muji (in the stationery section) and created dividers by cutting cardboard so I could dedicate a little compartment for each cookie or component. 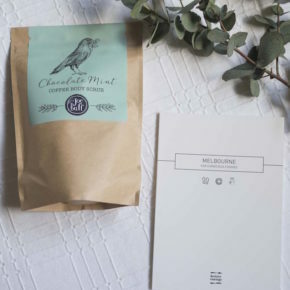 You can easily find some options at your local stationery store, variety stores/$2 shops (I love Astoria in Balaclava) or recycling old take away cake boxes or vintage tins. Select three to four cookies or desserts to fill your boxes with. I chose German Christmas Cookies (recipe here), Hazelnut Horseshoes (recipe here), Rum or Yum Balls (recipe here) and Gingerbread Triangles (I halved this recipe and used a triangle cookie cutter to cut out each piece). I also added some bael fruit pieces for tea, you could include small sealed jars of homemade salted caramel, homemade fudge in wrappers, even Christmas decorations, the list is endless. 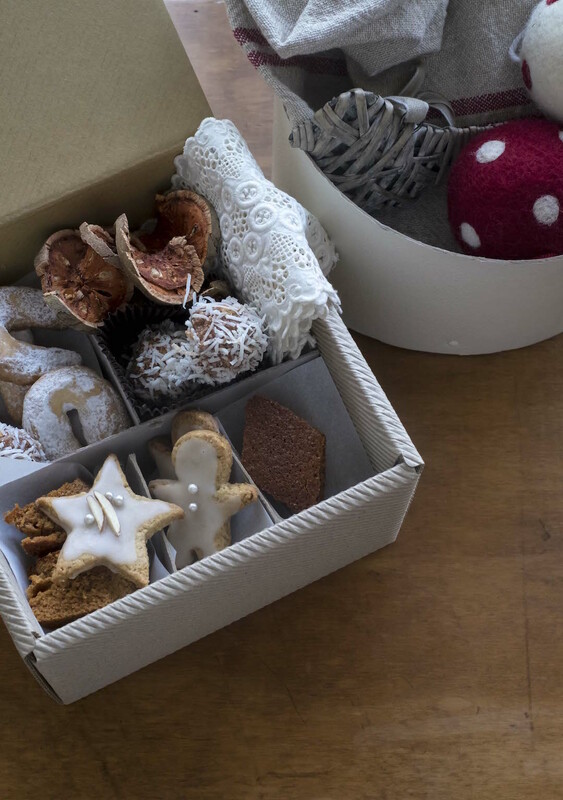 Before placing the biscuits or treats in the box be sure to add a little ‘cushion’ for them. You could use baking paper pieces, cupcake liners, or wrapping paper pieces. Then when everything’s in place, simply seal your box with a Christmas sticker or tie it closed with a ribbon with a name tag or card and gift away. There! 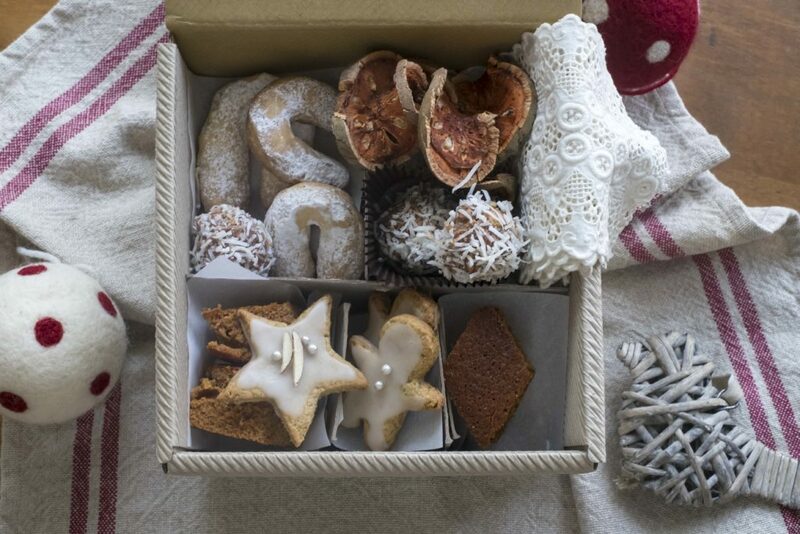 You’ve created your own Christmas Cookie Box! Let me know if you try this at home this year.